Tattoo removal is the safe and effective treatment method that will gradually remove any unwanted dark tattoos from anywhere on your body. What tattoos can be treated? At Aspire Medispa Sydney, we use the Lumines Q-Switch ND:YAG laser which has been proven to effectively treat black and dark pigmented tattoos. 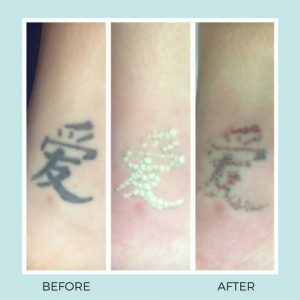 Q-Switch lasers release high-powered pulses of intense and rapid heat which force the tattoo pigment particles to fragment and over time, fade away. The selective nature of the Q-Switch laser, means that the surrounding skin and tissue is left safe and untouched. Most tattoos will require between 4 and 12 sessions spaced approximately 6 to 8 weeks apart. However, this will depend on the quality of the tattoo, scarring on the area that will be treated and how your body responds to the laser. Individual results may vary. Patients may experience mild frosting (white powder-like coating) on the tattoo for up to half an hour after treatment. This is usually followed by some mild erythema (reddened skin) and occasionally some swelling. Mild blistering may also occur with some patients, however this is found to be very rare. Majority of patients will find that the area calms down within 24 hours and will only notice mild crusting of pigment over the treated area. having only one tattoo removal session.